Lake Anna Striper Guide Journal: Lake Anna Striper fishing is the bomb! Sunny and Warm, Water Temperature 83* and clear. This morning I put 240 baits in the tanks, picked up my clients and went searching for schools of Stripers. We looked for about 15 minutes and set up on a few pods of fish but I believe the cold front that blew through yesterday messed the bite up for awhile. About 9 o'clock Tony called and said he found the mother load so I went to him to see what he was talking about. We set up on them with 10 downlines and for the next two hours straight we constantly reeled in fish. 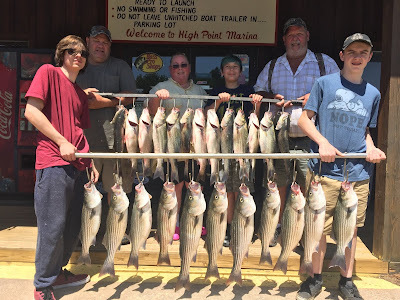 What I mean by that is we had 3 or 4 Stripers on a once for over 2 hours! Thankfully Tony brought us 150 more baits before we ran out. Patricia was manning two rods in the back of the boat and literally before she could get both in the water one would hook up. I believe she actually got frustrated because it was too much action! She and the rest of the crew worked together as a team to keep on the school and catch so many Stripers. This morning we took at least 350 hits and who knows how many fish we actually boated. This kind of fishing is as intense as it gets. Once everyone understands hot to deploy the baits to the exact depth the game is on. Hard to imagine what it is like without actually experiencing it in person. Thanks to Scott and Danny for helping remove the fish so we could keep baits in the water. If you want to try this kind of fishing get a crew of people and we will hook you up.